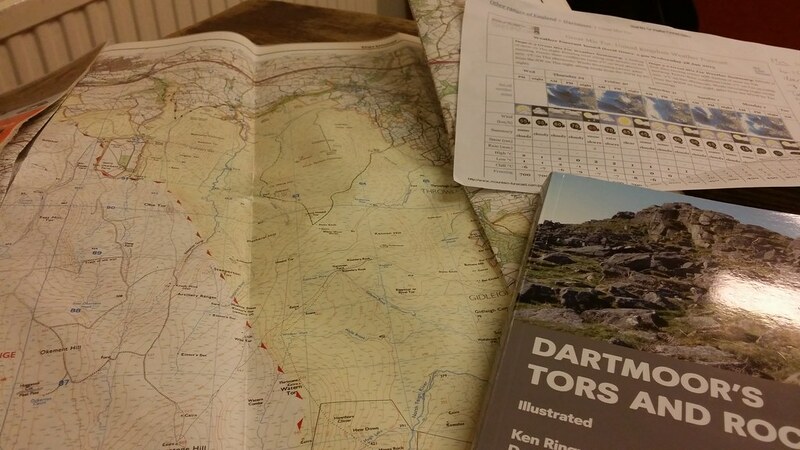 I pull into the car park at the Plume of Feathers and find Phil, settle into the bunkhouse, while Phil proudly shows me his recent additions to his library – Crossing’s book and the Dartmoor 365 book. As I unpack, Phil regales me with extracts from both. First impressions of Crossing aren’t great – it’s closely printed text and anything which contains passages along the lines of describing a path and then several sentences later telling you that you’re not actually going that way, is likely to see me fling such a book from the top of the nearest tor. The illustrations are basic too, and that’s even having got a friend with more artistic ability to do them. Phil is blinkered towards the magic of Crossing though, and tries to defend the art within by stating that it was 1902 – I don’t have the heart to point out all of the fine line drawings done in the centuries before. I get my revenge by showing off my box of colour-coded individual tor laminates culled from 2 copies of Ken Ringwood’s book. Phil has to make do with huge A5-sized double pages. I suspect that none of what’s written in this paragraph paints either of us in a great light. Over the course of the day the planned party of 3 (Paul, Phil and me) has swollen to 5 with Rich and Phil’s old friend Neil spotting a bandwagon on which to climb. Phil and I settle down in the Plume to await the arrival of the others, Neil arriving around 8pm in time for us to order dinner, Paul and Rich arriving around 11:30 and fortunate to even get a pint. 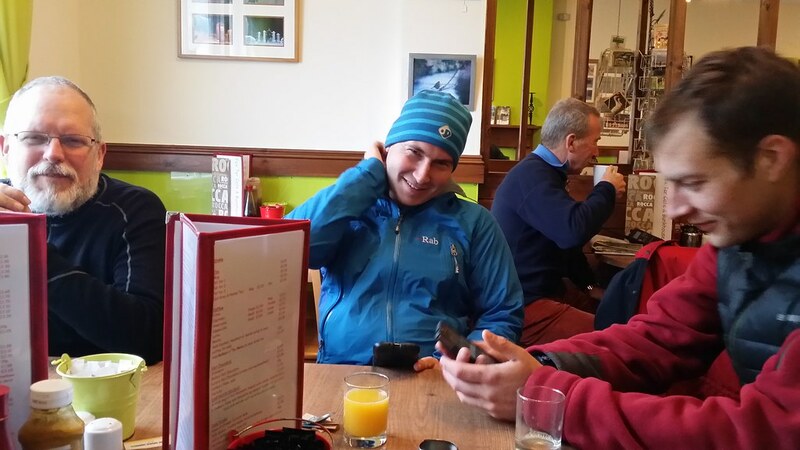 The tone of the weekend is set with much competitive banter about the Social Hiking Dartmoor Tors and Rocks list and threats from Phil to delete the other participants’ Social Hiking accounts if we have the temerity to overtake him. Chunky flakes of snow fall outside as we retire for the night. 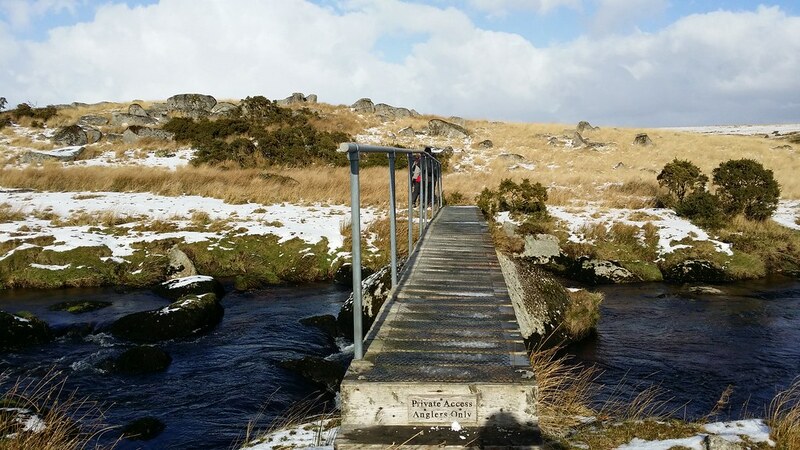 We have a route planned – a circuit of Fernworthy Reservoir, but this is ditched in favour of something “safer”. 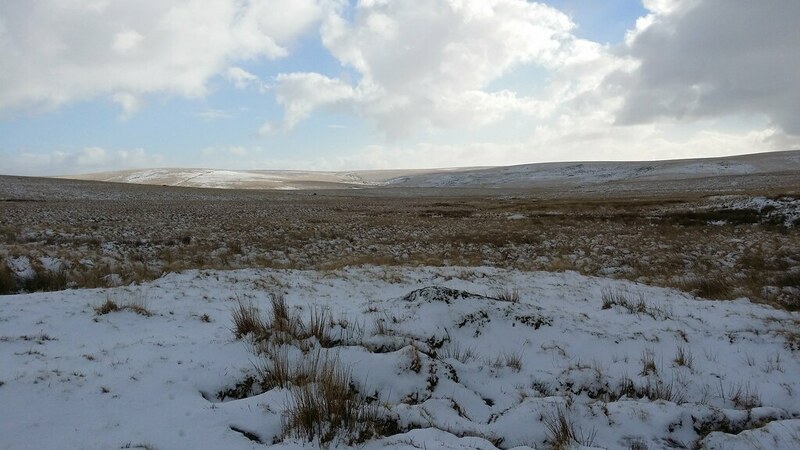 In this instance “safe” referring to the ability to get back from the walk afterwards with the moor in winter conditions. 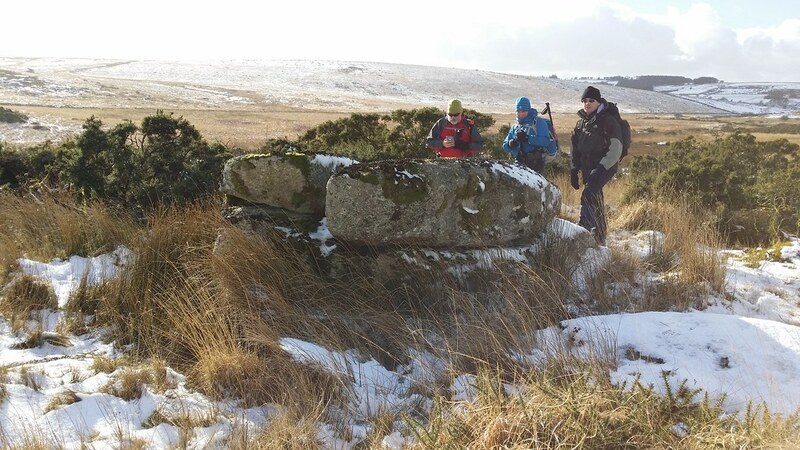 Reluctantly, the group decide that a walk from Princetown itself is the way to go. As long as it’s not another tour of Walkhampton Common I’m fine with this – I’ve been out there twice in the last month. 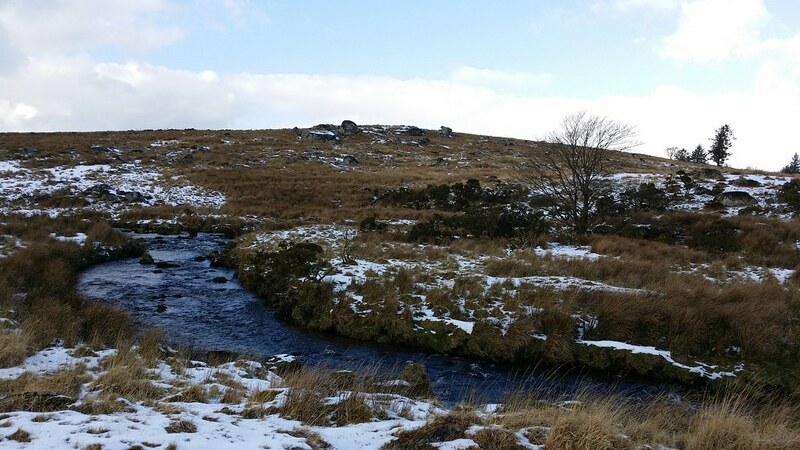 We settle on a route over North Hessary Tor to Great Mis Tor, with the idea being that we will loop around the upper part of the Walkham, pass Princetown well to the east and finish off by entering town from Round Hill. I’m fine with this – every tor or rock we visit will be new for me. It’s raining ice as we set out, and moreover it’s in our faces, and remains so for another couple of hours. I can feel my face numbing from the cold. The group adopts a variety of disguises reminiscent of characters in a post-apocalyptic film in an attempt to stop bits freezing and snapping off from our visages. 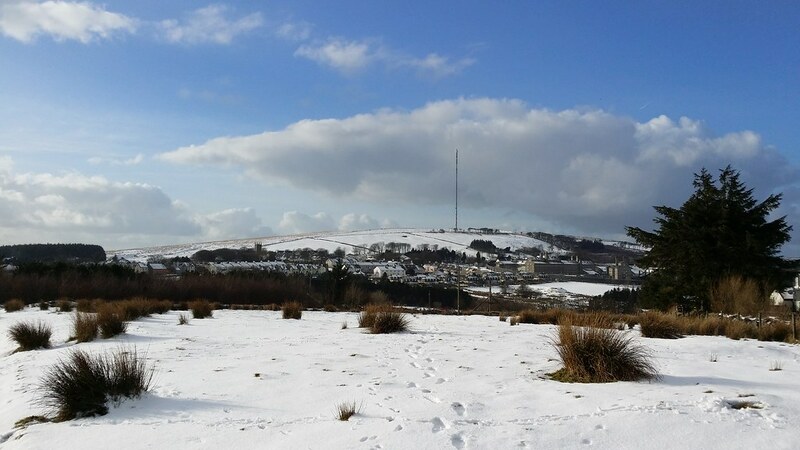 After three weeks of not doing much, it’s also hard work climbing up to North Hessary – a mischievous hill where the presence of the TV mast makes the top look very close from the bottom, but which never seems to get any nearer in reality when you’re trying to climb it. 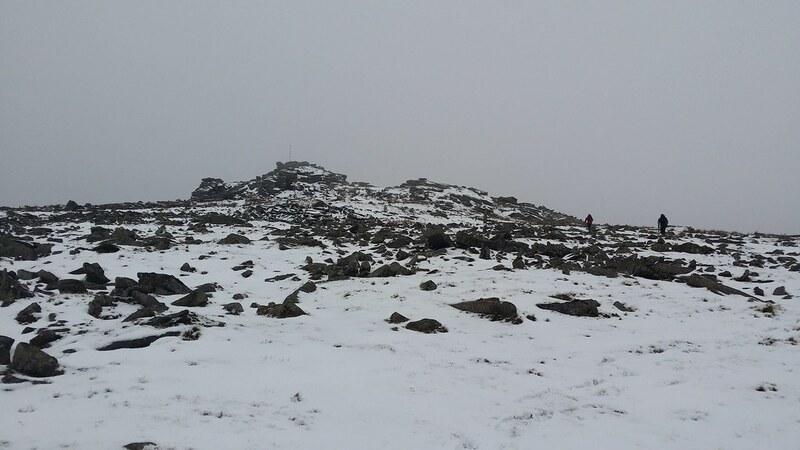 The snow doesn’t make this any easier, although this is mainly psychological at this point – I know that walking in snow is harder, so it becomes somewhat self-fulfilling. We make it to the tor and while the more nimble members of the gang climb on to the tor itself, in an attempt to convert themselves into permanent ice sculptures atop it, I cower under an overhang. 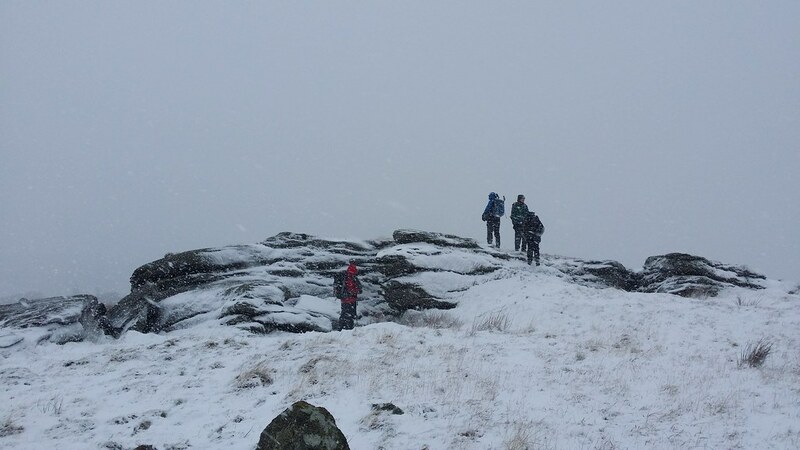 For me, this isn’t the weather to climb slippery bits of rock. 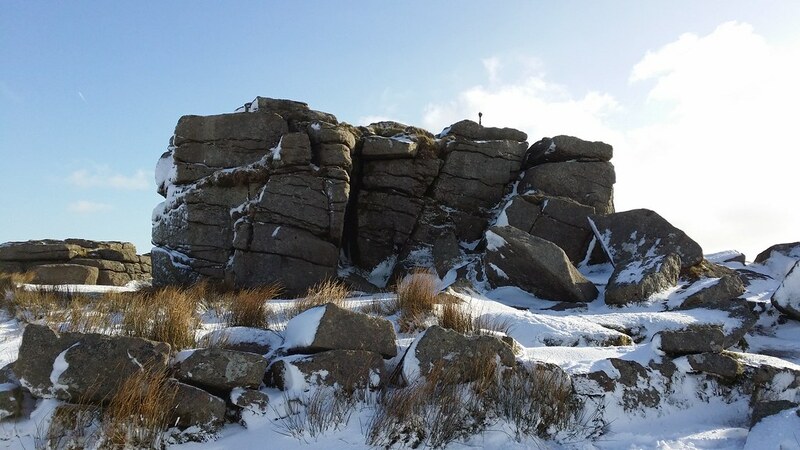 We have some fun climbing the wall that lies between us and Herne Hole Tor – the ladder stile (words cannot convey how much I despise those things), is slippery with ice, and the alternative is dealing with the lake in the nearby gateway. On the way back, a couple of the others decide that the certainty of wet feet is preferable to a headlong fall from the top of the wall. I simply go slowly and wedge my feet as I scale the ladder. It works. 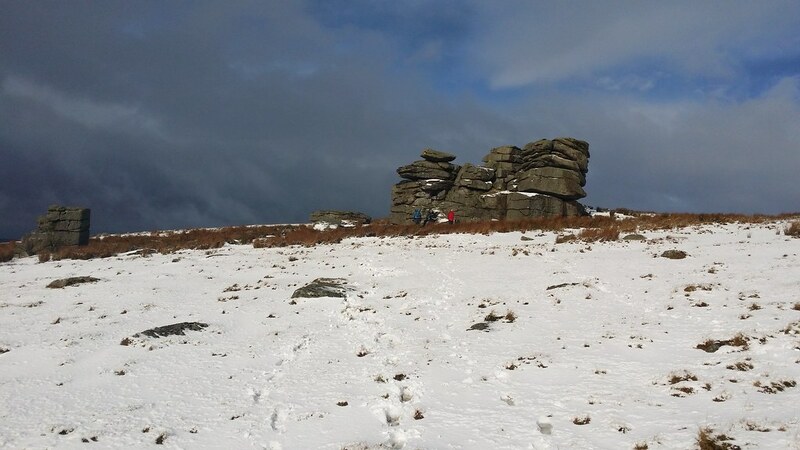 We pick off Rundlestone Tor and Hollow Tor and then descend to the road for the next section of the walk. A couple with a young child and a sledge join us on the track up to Great Mis, although we divert briefly to visit Little Mis first. We then find ourselves separated by the sheer bulk of Great Mis as some members of the party climb it, while I settle for a circumnavigation. 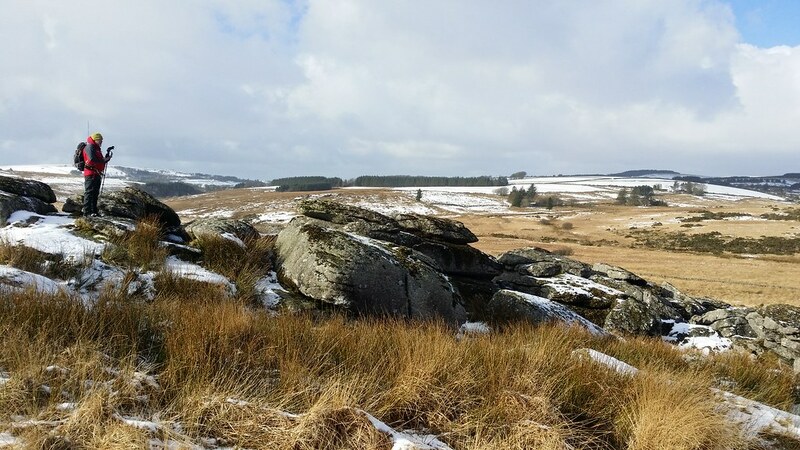 A decision is now made to set out on a quest for Clay Tor, although no one seems to know that’s the name of it apart from me – one point for the laminates, which I have with me. We descend towards the Walkham and there is much contouring to the south of the river, as that’s where Social Hiking has it. Rich and I hang back, our interest taken by a load of rock on the north bank and the fact that it matches the grid reference on the laminate. 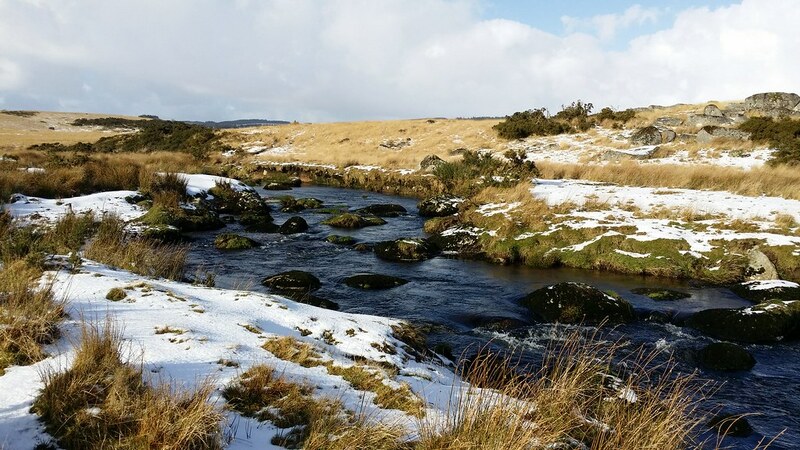 We descend to the river to try to find a way across – it’s too wide to do safely – so we rejoin the others and the group agrees it’s not where we expected it to be. This seems to be an example of where the conversion of grid ref to lat/lon has given a misleading result. We get on with the walk though, Black Dunghill our next target – not a rock or tor, merely a hill. This involves much wading through snowy tussocks of grass, but the view opens out a bit to compensate. 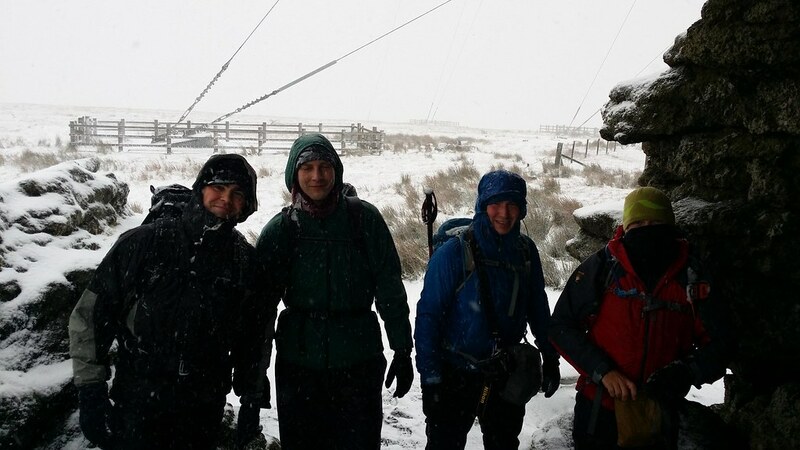 Now we descend to Holming Beam and shelter in the lee of a hut for a lunch stop. At this point I know I’m just wanting to road walk the rest back to Princetown, and not bother with Round Hill. 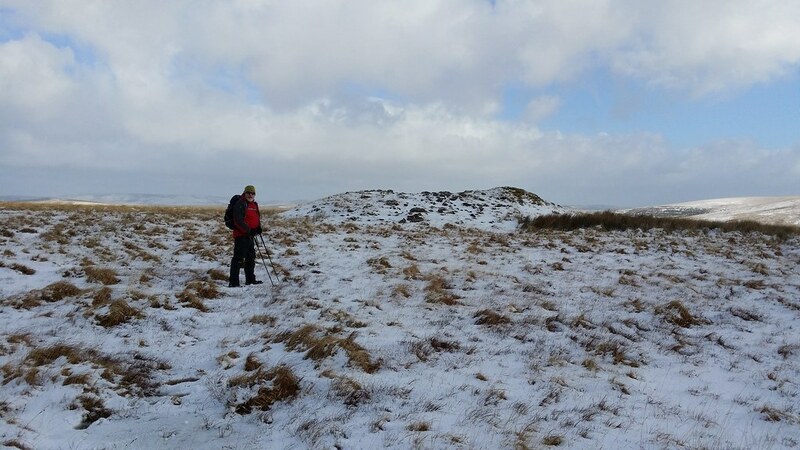 Paul’s with me on this, he having seriously considered bailing out on Rundlestone Tor. Phil’s foot is hurting and he’s looking for the shortest route back too. 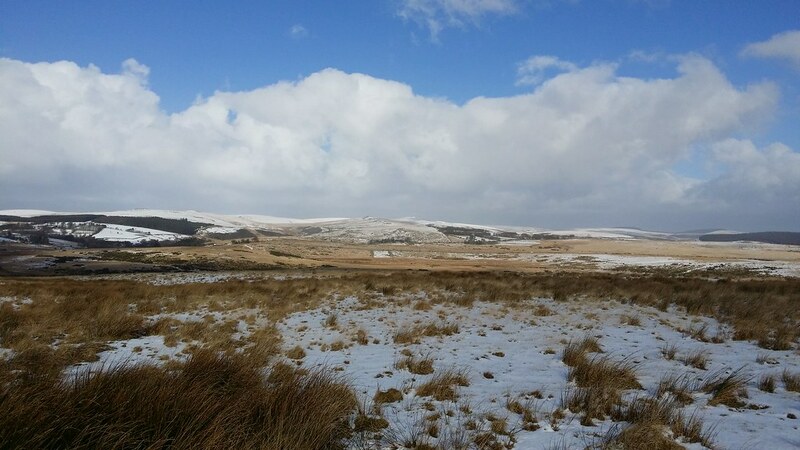 We dodge the cars on the track down to the main road, take a short cut across a field and walk back into Princetown, no one else fancying the Round Hill bit either, especially with the day so far advanced. 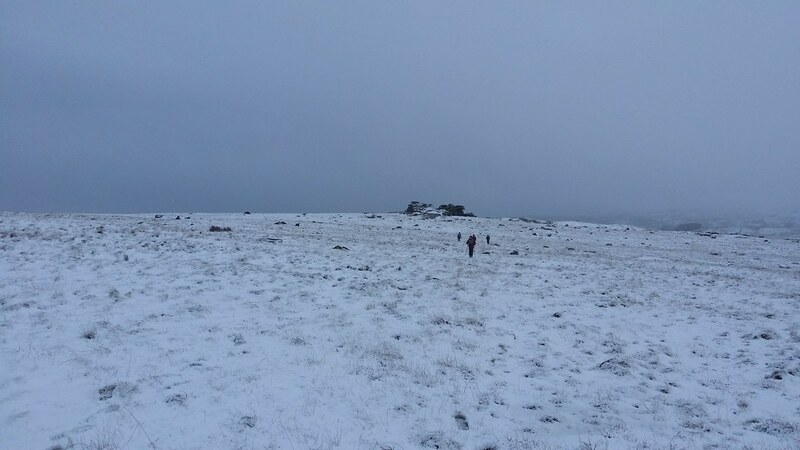 It snowed heavily last night while we were watching from the pub, and now all thoughts are focused on the ability to get home – well everyone except me as I extended my stay in the bunkhouse for a further night. 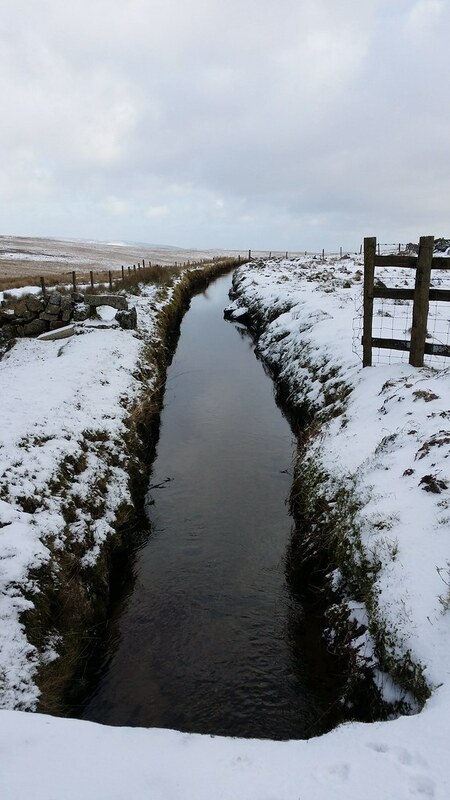 Reassured that the main road through town is clear, and deliberately kept so because of the prison, thoughts turn to another walk from Princetown, and I’m delighted that we settle on a circuit of Royal Hill, one of the routes that’s been on my to do list. 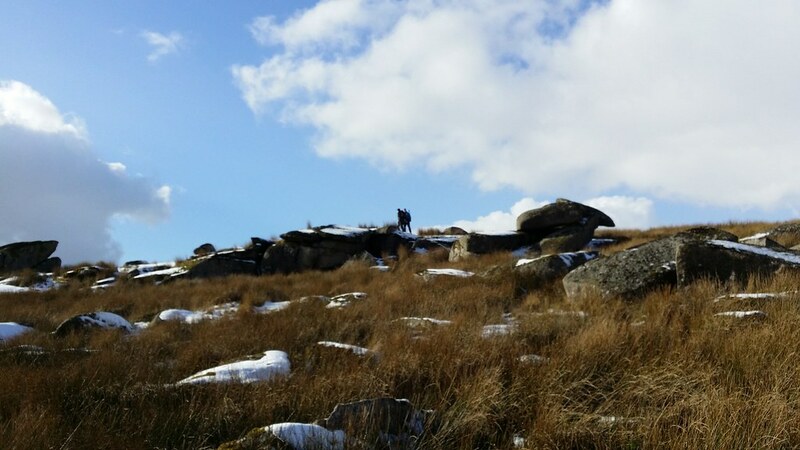 Phil’s foot opts out of the walk, instead choosing the visitor centre and the Fox Tor as his base of operations for the day. 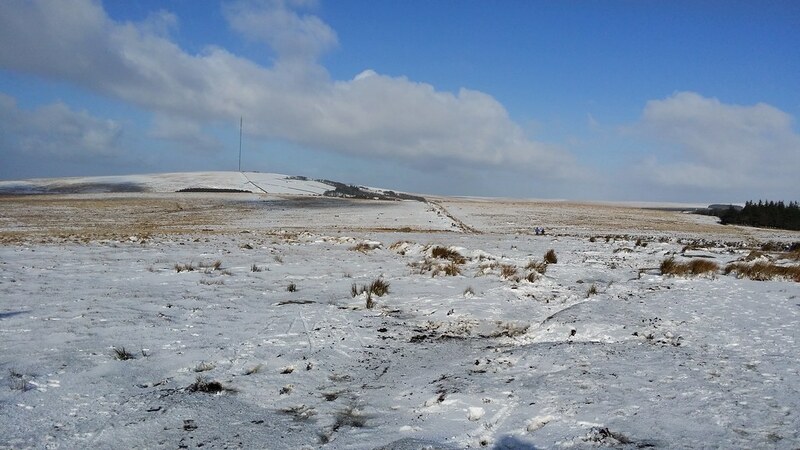 So a man down, the four of us head out along the track to South Hessary Tor. 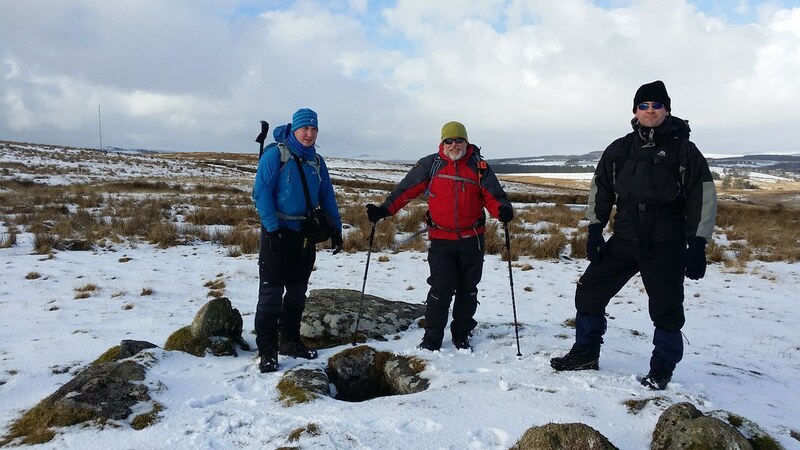 From there we drop down to Peat Cot en route for Strane Tor, so that Rich can bag it properly this time. There’s not much to see with it all covered in snow. 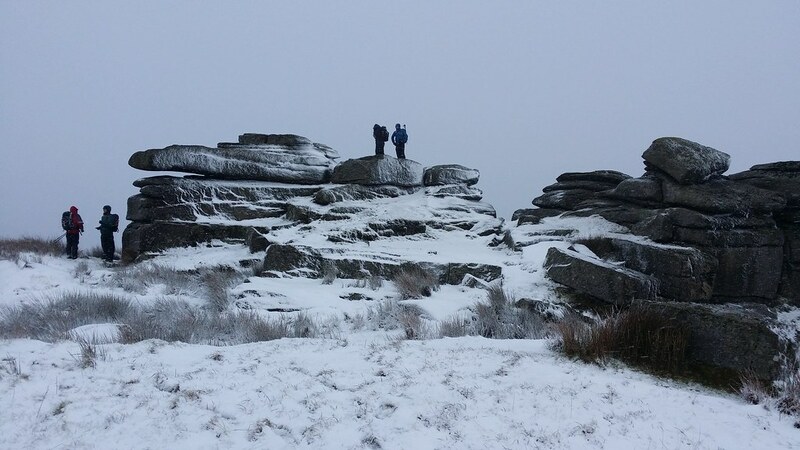 We now climb Royal Hill and take in the view from the top as well as visiting the tor which isn’t quite at the top. 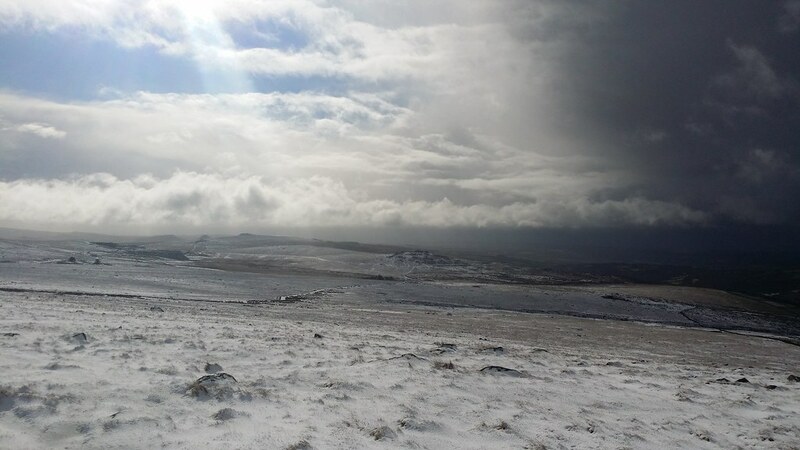 Next up, we descend to find the Crock of Gold and join the track for a short way before finding our wall to the other side of the wall and Blakey Tor. Many impressions inspired by a dodgy 70’s comedy then ensue. 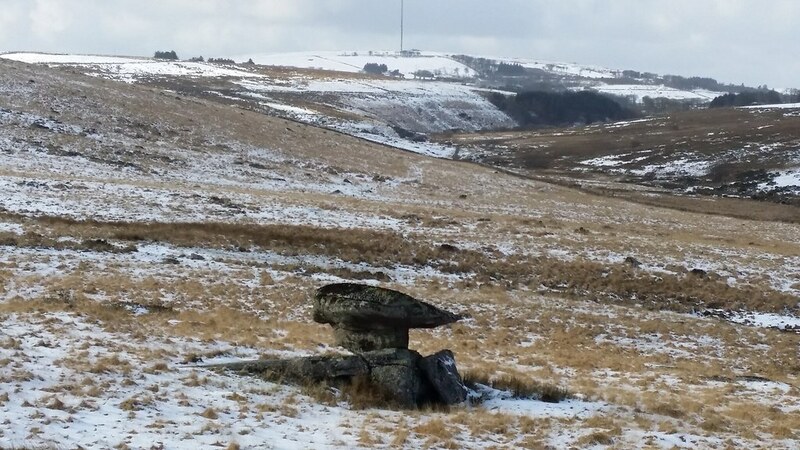 Just below the tor, there is a prominent perched rock and a contest begins to give it a name – Chicken Fillet Rock, being my entry. 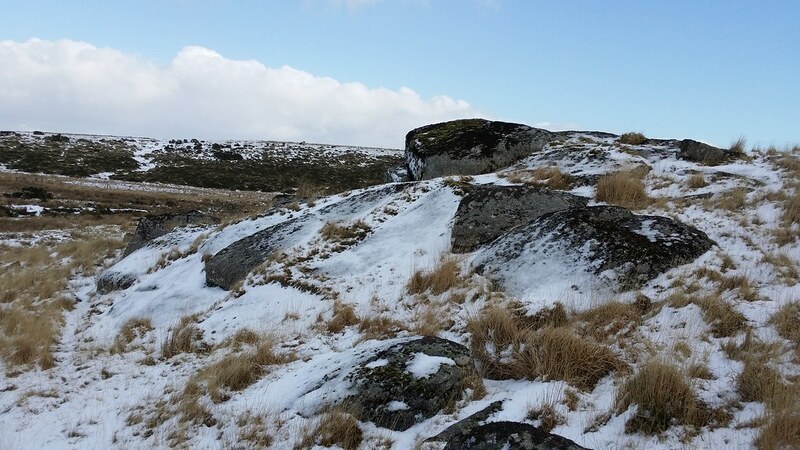 North to the Black Brook now and today’s anomaly in the Social Hiking Tors and Rocks List. 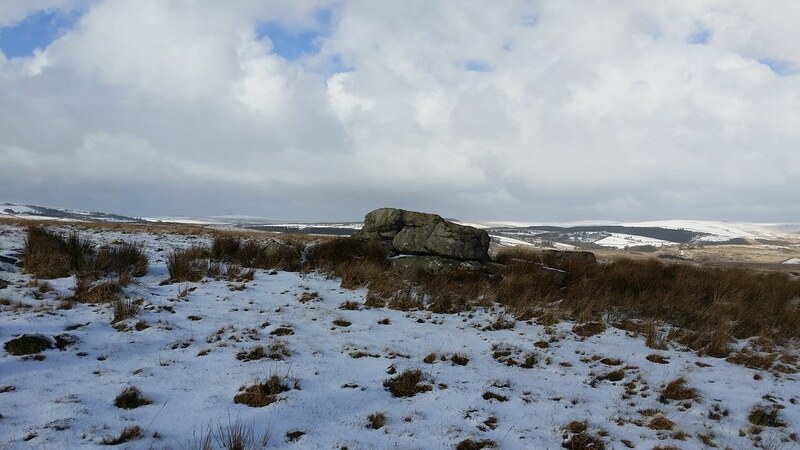 We arrive at Buck-Sorrell Rocks, named as Messrs Buck and Sorrell think Prince Hall Rocks should be, as being more prominent (and closer to Prince Hall too) than the official position. It’s difficult to disagree with them when we come upon the meagre display of Prince Hall Rocks a little further west. 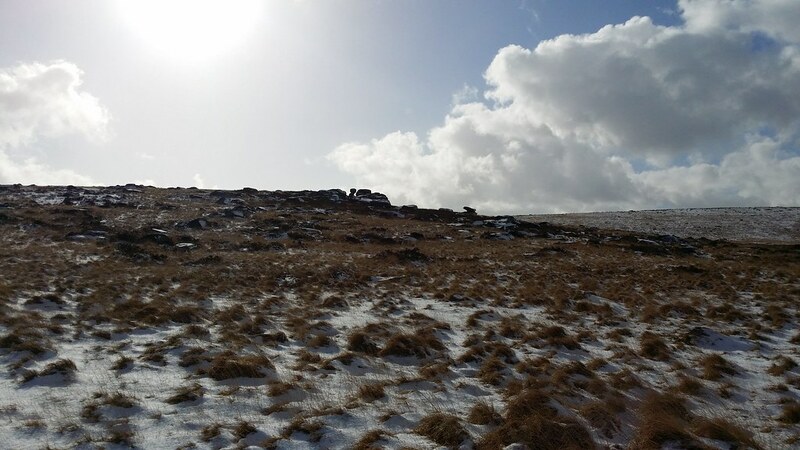 With the end of the walk in sight, we climb up to Round Hill Tor and then it’s a matter of a straightforward bridleway back to Princetown. There’s a bit of milling about as Paul, Rich and Neil gather their stuff, then all of a sudden I’m by myself. I retire to the luxury of an entire bunkhouse to myself and plan the next phase of the adventures. Those photos are beautiful. 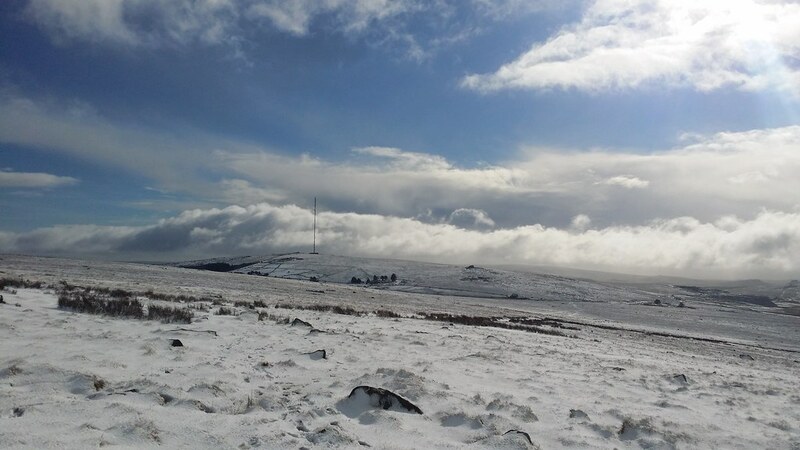 Dartmoor looks so grand in its snowy coating! Indeed. Wait until you see the next set from my overnight walk. 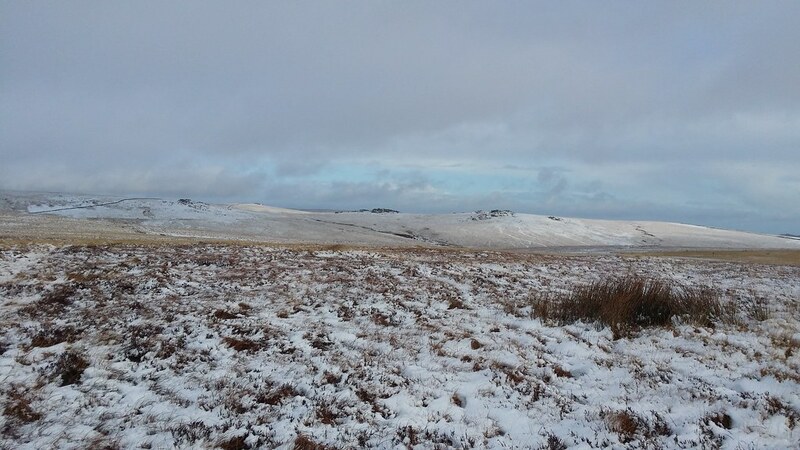 I think I actually prefer Dartmoor in winter to somewhere like the Lakes. 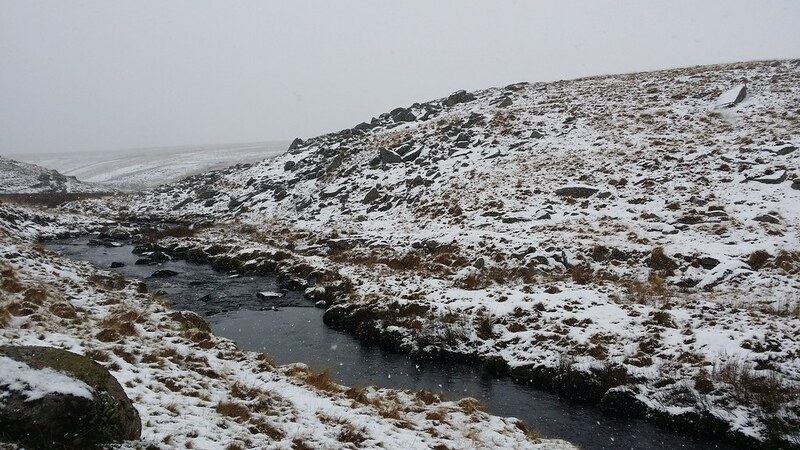 The snow and ice neutralizes the bogs and there’s no need for ice axe and crampons, and you still get nice snowy views.